When the Star Edition of Thunder from a Clear Sky was being created a new book cover was one of the first things considered. 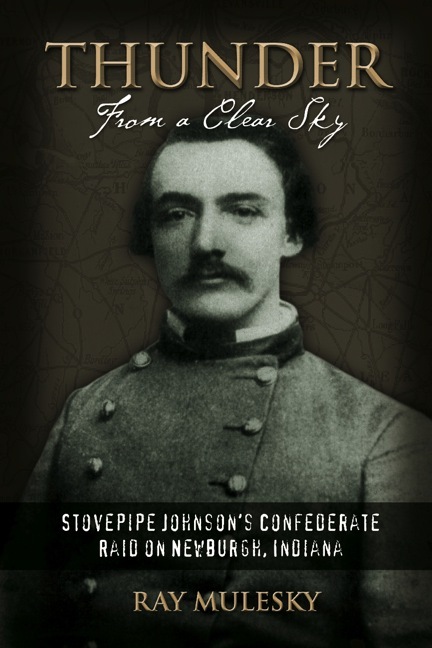 The publisher initially asked me for some book cover ideas of my own and asked me for an analysis of other Civil War book covers on the market- both ones that I didn't like and ones that I did. I floated many different ideas and offered two complete book cover mock-ups that I had prepared in my own feeble way using Photoshop. In the end, the publisher rejected all my specific ideas and designed something on their own. I really like what they did. Adam Johnson steps forward into the center of the cover, emerging from the faded, offset background of the original. The photo is an 1863 image which must have looked very much like Johnson did in mid-1862 during the raid (sans uniform, of course). He is now rightfully center stage. The background is a faded map of western Kentucky - the place he called home and the place where most of the Partisan Rangers came from.